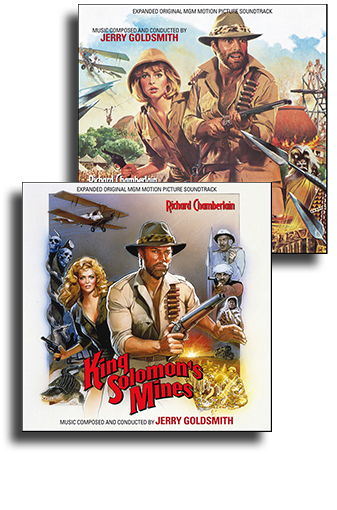 2 CD-set of Jerry Goldsmith's King Solomon's Mines released..! Richard Chamberlain and Sharon Stone. of 1900s Africa. They are pursued by hostile tribes and a rival German explorer. masterfully written and completely orchestral (during the period when the composer was beginning to experiment with synthesizers). Goldsmith conducts the Hungarian State Opera Orchestra of Budapest. The soundtrack to King Solomon’s Mines has a complicated album history. in the U.S. on LP by Restless Records. added three short cues, though the track order was disjointed. a new expanded program, properly sequenced but still incomplete. film score and improving the sound, correcting the speed with a new transfer. prized CD in the second-hand market. although recorded in a separate take). full color booklet with liner notes and track-by-track analysis by John Takis.